A suicide bomber has blown himself up in the Afghan capital, Kabul, wounding three people, Afghan officials say. The attack happened close to Babur's Gardens, containing the tomb of the founder of the Mughal empire. One report said the bomber was on foot and he detonated his explosives when he saw a security checkpoint. 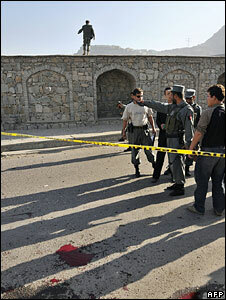 Afghanistan has seen a sharp increase in violence recently. Taleban militants recently vowed to step up their attacks in the capital. Afghan officials said three civilians riding in a minibus were wounded in Tuesday's attack. Earlier this month, a suicide bomber rammed a car full of explosives into the gates of the Indian embassy in the Afghan capital, killing 41 people and injuring 141. Five embassy personnel were killed - India's defence attache, a senior diplomat and two security guards - as well as an Afghan man. It was the deadliest attack in Kabul since the overthrow of the Taleban in 2001.